Personalized Multiple Sclerosis Awareness Teddy Bear - 18"
Support your loved one with this great Personalized Multiples Sclerosis Awareness Teddy Bear. 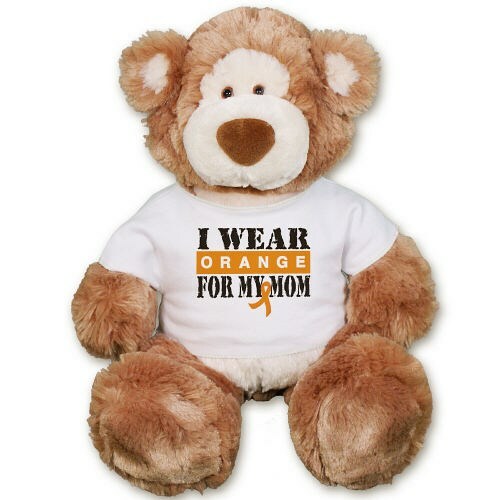 This I Wear Orange for MS design is featured on our premium, super soft Gund Alfie Bear. With amazingly silky fur, a broad smile and big nose, this two-tone bear is a big winner with everyone who holds it! Measuring 18” and includes free personalization of any title. Free Gift Wrapping and a Free Gift Card are included to create a thoughtful presentation. Additional Details We have created a wonderful collection of Awareness Plush Animals to help show your support. You will also enjoy our MS Athletic Dept. Teddy Bear as well.